Hi~! Welcome to the Alpha Site of DCinemaCompliance. We invite you to cruise around, to see where we have gotten thus far with this QualityActive© tool. To do that you can sign in with the name and password of joew. Got that?? joew...for both. The DCinemaCompliance system is set of Quality Assurance tools for a cinema chain's projection and engineering facilities. It is open source and free, supported with a SaaS model. One downloaded file installs the SQL database and GUI, then prompts for the management/regional and local multiplex layers of a chain. Modeled on techniques derived from ISO 9000, employees are taught the skills and given the tools – lessons, checklists and DCPs – to self-certify their auditoriums for their customers and report back to the Office of the CEO that the picture / sound / safety experience of their auditoriums are at the levels promised. Technicians benefit by getting timely, relevant reports from an interested and trained staff. Management benefits from regaining control of all their information in a secure, RESTful system from which they can share chosen information with distribution and other associates. Video Presentation – with the idea that someone offering funding will want to know the state of the program. Post Installation | DCinemaCompliance Donation Project One from CJ Flynn on Vimeo. Checked regularly to make certain that the devices are still set up properly and working within expected (and promised) parameters. If the tool is computer-based, as many things are, its software (and firmware) needs to be updated and it needs to go through different backup and security steps, as well as be maintained. The people need to know how to use these tools safely and securely. There also needs to be a system that makes certain that these things are reviewed periodically, as appropriate to the person and system and tool. That is the basic concept of this compliance system. There is a section that includes an Inventory of everything in the projection area. There is a section that has checklists that go through each piece of the inventory on a regular basis. 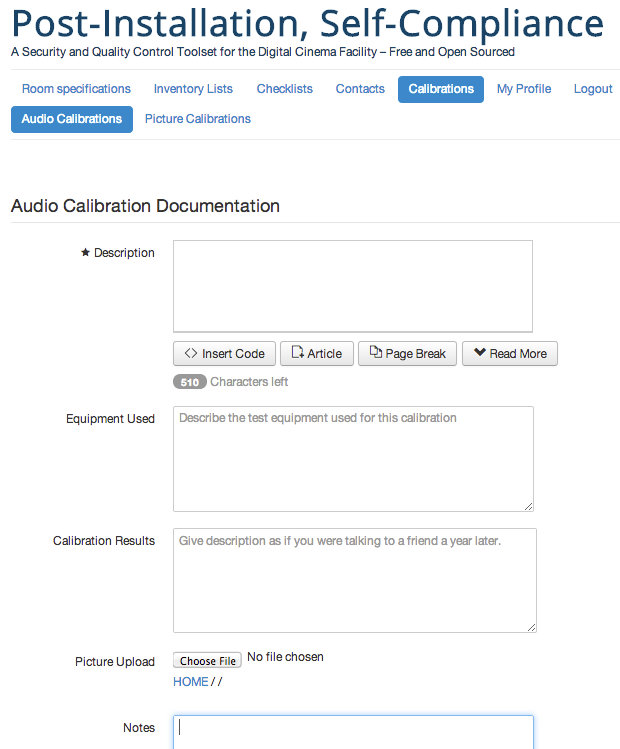 There is a repository that stores setup information for the audio and picture calibrations. ISO 9000/9001 – What's up with that? This is fine. Everyone should tie into the ISO 9000 plan. Except, the set up and implementation takes a long time because everyone has to be real specific about what they are going to do at each step, and how they are going to verify each step is done correctly so that some customer on the other side of the planet can rest at night knowing they bought the right stuff. And, you can't just make one section of your establishment according to the principles. The entire facility has to be aligned with checklists that verify that the floor was the right level of clean and everything else in between. Small companies don't have the time to let executives go off to get trained then make up a billion page set of policies and procedures for everything from the front door to the exit and all the seats in between. But, in the case of the cinema, it would be great to have the main operating engine – the projection room – get the kind of constant and organized care that will more likely give more hours of great customer experiences. Especially since there are nearly 100% fewer technical people going through the projection room on any given day. Especially since there is a million dollars of equipment in a 10 screen facility, with the precious 100s of millions of dollars worth of copyrighted materials from all those studios. Especially when there are other benefits too. For example, one place for all the information to go. The router went out, and I have a new one. Did anyone back up the old setup file so I don't have to spend hours getting it set up again? Yes, it is downloadable from the inventory page for the router. The distributor wants to know the PEM file for the projector in 7 before they'll send us the key. Yes, it is downloadable from the inventory page for the projector. In fact, a report can be sent regularly to the distributor with all the information applicable for them and nothing else, because the inventory database is set up to be RESTful – a technical term meaning that the informatin is secure, but it is also able to be used in a sophisiticated way with people who you trust. This page could go on and on, but it is time to get to the next section. Welcome Hi~! Welcome to the Alpha Site of DCinemaCompliance. We invite you to cruise around and see where we have gotten thus far with this QualityActive© tool. To do that you can sign in with the name and password of joew. Got that?? joew...for both. Explore. When you get to the Inventory or Checklist or Calibration pages, try hitting the little blue circle with a Plus Sign to see where things go.